The following are ageism focused resources. If you would like to share on this page a news item or resource that counters ageism, please send the request to info@nyceac.org or via NYCEAC’s Twitter, Facebook, or LinkedIn. 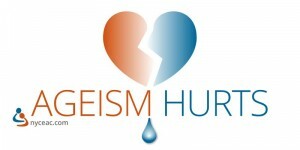 Click here for more information on our countering ageism initiatives. The following pieces were featured online by traditional and non traditional media sources. Read about the Silver Linings of Aging from New York Times Op-Ed Columnist Frank Bruni. High 50 discusses why we need to We Need To Combat Ageism Just Like We Do Sexism And Racism in this Huff/Post 50 article. Anne Karpf details the Liberation of Growing Old in a New York Times Opinion piece. David Brooks explains Why Elders Smile, citing psychology that supports greater levels of happiness in later life, and the benefits that a lifetime of experience can bring to our mental well-being. Senior Planet finds some Glimmers of Hope in TV-Land as new shows feature older adults in a new light, and break down stereotypes in the process. Taste of Cinema recaps and dives into 10 films that portray the depth and complexities of aging, some from as early as the 1950s, and from countries around the world. In this compelling Huffington Post piece by Kyrié Sue Carpenter, Ageism: A Call to Awareness*, the author invites the reader to “add an asterisk to aging...there is more to the story than the assumptions that come with a number.” Video Introduction by Ashton Applewhite, of This Chair Rocks. Molly Kraybill, a student at Eastern Mennonite University, photographed women from ages 1 to 100 and asked them what they liked about their age, the collection explores aging and the beauty inherent in every stage of life. David Bailey,who is 76 himself, photographed some of Britain’s oldest residents ranging in age from 100 to 107 and collects some of their life story and lessons for others. Angela Jimenez captured the stunning black and white images of senior track and field athletes in her series “Racing Age” which were featured in this Huff/Post50 article. These video resources come from many sources but each either highlight positive role models in aging or anti-ageism work. Finding the Why; Enabling Active Participation in Life in Aged Care explores how one care facility changed to help those with dementia connect to the meaning and purpose in their lives. Karl Pillemer’s latest book 30 Lessons for Loving collects advice from 700 older adults on love, relationships, and marriage. To hear more from Dr. Pillemer see this video. Learn about New Yorker of the Week Ruth Taube who has worked at the Henry Street Settlement on the lower east side for almost fifty years sharing her love for sewing. In this video Gerda Lerner reads her own poem In Praise of Aging. This section provides links to articles and groups that call for recognition of ageism and change to help counter it. Laura Robbins provides an in depth look at The Pernicious Problem of Ageism in this article from Journal of American Society on Aging. Ms. Robbins discusses the staggering impact of ageism on older adults in the United States and how activists seek to bring light to this issue and bring justice to our aging population. Kathy Greenlee, the Assistant Secretary for Aging and Administrator of the Administration for Community Living (ACL) at the U.S. Department of Health and Human Services (HHS), urges domestic violence providers to ensure that their resources are available to all community members, including those with disabilities and who are older in this blog post for the National Domestic Violence Hotline. Paul Clegg hosts What’s the game? a blog dedicated to playing basketball after age 50. Framework Institute is a coalition of Eight of the nation’s leading aging-focused organizations that have formed an unprecedented partnership to create a better public understanding of older adults’ needs and contributions to society — and subsequently to improve the lives of all people as they age. The following organizations are committed to combating ageism. The Radical Age Movement is a grassroots, nationwide effort that challenges traditional notions of aging, and introduces new ideas for building co-creative and interdependent communities. Through conversation, consciousness raising, mainstream and social media, presentations, and social action, The Radical Age Movement seeks to build a movement dedicated to confronting ageism in all its forms. The International Council on Active Aging’s (ICAA) Changing the Way We Age campaign seeks to shift society’s perception of aging. ICAA is concentrated on active aging—an approach to aging that helps older adults live as fully as possible within all dimensions of wellness (i.e., physical, social, environmental, vocational, intellectual, emotional and spiritual). Old Lesbians Organizing for Change is a national network of lesbians age 60 years and older who working to confront ageism in our communities and country through advocacy, education, and public discourse. These training resources provide professionals with tools to combat ageism and to interact with special populations of older adults. The Re-Framing Aging Toolkit from the Frameworks Institute seeks to change public thinking about aging in America through original research on communication strategies on aging issues, and useful materials and tools to advance the conversation about older adults. Building Respect for Older LGBT Adults is intended for long term care and other aging service providers as an introduction to LGBT aging. The six 10 minute modules provide tools to create safe, welcoming, and inclusive services for LGBT older adults. In this article from the American Psychological Association’s Monitor, Melissa Dittmann explored how psychologists can respond to ageism. The term ageism was first coined by Bob Butler in 1969 in the Gerontologist. See this classic article and others from researchers working to combat ageism. Butler, R. N. (1969). Age-ism: Another form of bigotry. The gerontologist, 9(4 Part 1), 243-246. Butler, R. N. (2005). Ageism: Looking back over my shoulder. Generations,29(3), 84-86. Butler, R. N. (2009). Combating ageism. International Psychogeriatrics, 21(02), 211-211. Cherry, K. E., & Palmore, E. (2008). Relating to older people evaluation (ROPE): A measure of self-reported ageism. Educational Gerontology, 34(10), 849-861. Cohen, E. S. (2001). The Complex Nature of Ageism What Is It? Who Does It? Who Perceives It?. The Gerontologist, 41(5), 576-577. 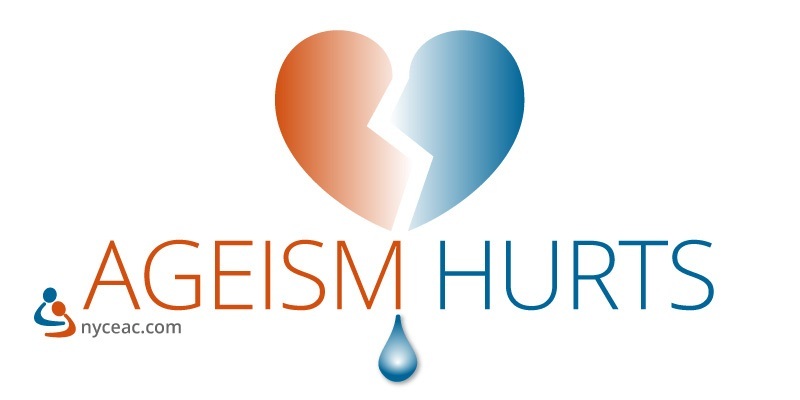 *Ageism Hurts graphic created by Nancy Oatts; nancyoattsdesign@gmail.com.